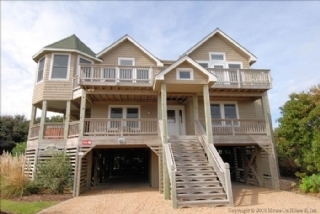 Conveniently located in a quiet cul de sac in the Sanderling subdivision, this elegantly appointed semi-oceanfront home boasts ocean and sound views, while being surrounded by the beauty of nature. Level 1: Enclosed car port and entry level. Level 2: Bedroom with two Singles shares a full bath with bedroom with Duo Bunk & Trundle. Queen master bedroom with private deck access; spacious King master bedroom with luxurious master bath, walk in closet, and deck access. Laundry area also on this level, as well as access to hot tub on deck. Level 3: Large great room with kitchen & dining; access to screened porch; elevated game area with game table & chairs; half bath. Also on this level is a second King master bedroom suite with walk-in closet and deck access. Taxes and fees are not included.